Thank you for continuing this journey of The Gospel Project® for Kids. This week we are in Luke 24:13-35 and Mark 16:12-13, as we discover Jesus’ teachings after His resurrection. On resurrection morning, the angel at Jesus’ tomb asked the women, “Why are you looking for the living among the dead?” (Luke 24:5). Even when Peter and John ran to the empty tomb to see it for themselves, Peter was amazed but uncertain (Luke 24:12), while John believed (John 20:8). That same day, two disciples were walking to Emmaus, arguing about recent events. Jesus began walking next to them, but God prevented them from recognizing Him. (Luke 24:16) Jesus simply asked them what they were arguing about. They stopped walking. How could He not have heard about what happened over the last three days? Teach your kids the Bible is not a moralistic tale. The Bible is about Jesus. When Adam and Eve sinned, God began working out His plan to send Jesus to rescue people from sin. (Gen. 3:15) All of the Old Testament points forward to Jesus’ life, death, and resurrection—the time when Jesus would bring God’s promised salvation for sinners. Give each family member a Bible. Call out a book of the Bible and challenge each person to find it. Vary the difficulty of the book being found. Read Luke 24:13-35. Remind kids that Jesus taught that the Bible is about Him. Tell kids that no matter where they turn in the Bible, they can know that it all points to God’s plan for Jesus to come to earth, die on the cross for our sin, and rise again three days later as a picture of His victory over sin and death. 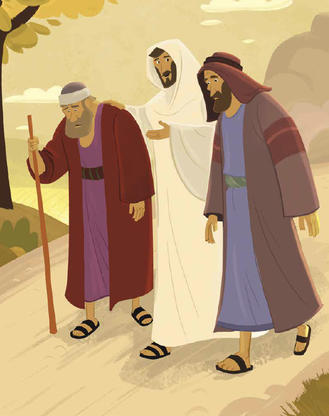 What did Jesus explain to the disciples on the road to Emmaus?